A classic Ottoman inspired dish served with a cubed turkey over a creamy smoked eggplant sauce. A classic Turkish dish consisting of ground lamb, grilled on a skewer and served wrapped in lavash and topped with tomato sauce and yogurt. Gulf Coast Tilapia wrapped in fillo dough and baked in a stone oven, served over greens, white wine & tomato reduction, garnished with toasted pine nuts. Layers of eggplant, zucchini, carrots, peas, peppers, onions, tomatoes and potatoes, topped with Bechamel sauce and cheese. Caramelized upside down milk pudding served in layers. Delightful baked golden pumpkin cookies made with semolina and soaked in sweet scented syrup. A popular Turkish salad made with tomatoes, cucumbers, peppers, onions, fresh dill, mint and parsley mixed with extra virgin olive oil and lemon juice. Fritters made from zucchini, feta, eggs, scallions, dill, parsley and served over a housemade garlic-infused yogurt sauce. Marinated diced chicken or lamb char-grilled on a skewer. Herbed and grilled ground lamb and beef patties. Turkish Tabouli made with bulgur, chopped walnuts, scallions, mint, parsley and mixed with olive oil. Hand rolled phyllo dough stuffed with Turkish feta, parsley and flash fried. Shredded wheat wrapped around Hatay cheese, topped with a mulberry extract, oven baked, and dressed with our housemade syrup. Çoban Salatası & Yaprak Dolmasi –Chopped tomatoes, cucumbers, peppers, onions, fresh dill, mint and parsley mixed with extra virgin olive oil and lemon juice & Turkish grape leaves filled with our own blend of rice, pine nuts and currant stuffing. Mücver- Fritters made from zucchini, feta, eggs, scallions, dill, parsley and served over a housemade garlic-infused yogurt sauce. Karniyarik – A classic Turkish dish consisting of eggplant stuffed with a mix of sautéed chopped onions, garlic, black pepper, tomatoes, parsley and ground beef. Tavuk İskender – Chicken Döner Kebab on a bed of toasted Turkish bread, home-made yogurt and tomato sauce. İstim Kebab-A classic Ottoman dish of lamb shank, slow braised in a tomato & herb marinade, served over a creamy smoked eggplant puree. Balık Böreği- Gulf Coast Tilapia wrapped in filo dough and baked in a stone oven, served over greens, white wine & tomato reduction, garnished with toasted pine nuts. Talulla’s Güveç- A delightful entrée of sautéed seasonal vegetables slowly casseroled in a rich tomato, herb and wine sauce presented with a choice of lamb, chicken, shrimp or vegetarian. Sebzeli Musakka- Layers of zucchini, carrots, peas, eggplant, peppers, onions, tomatoes & potatoes, topped with béchamel sauce. Karışık Izgara (Mixed Grill)-Meat sampler with Doner Kebabı, chicken şiş kebabs. , Dana şiş. Crème Chocolate- Melted Belgian chocolate with Kahlua topped with homemade whipped cream and walnuts. Kazan Dibi-Caramelized upside down milk pudding served in layers. Baklava – Layers of phyllo dough with walnuts, baked and topped with syrup and pistachio nuts. Chicken Döner Kebab on a bed of toasted Turkish bread, home-made yogurt and tomato sauce. A classic Turkishdish consisting of eggplant stuffed with a mix of sautéed chopped onions, garlic, black pepper, tomatoes, parsley and ground beef. A classic Ottoman dish of lamb shank, slow braised in a tomato & herb marinade, served over a creamy smoked eggplant puree. Gulf Coast Tilapia wrapped in filo dough and baked in a stone oven, served over greens, white wine & tomato reduction, garnished with toasted pine nuts. Layers of eggplant, zucchini, carrots, peas, red & green pepper, onion, tomato and potatoes topped with béchamel sauce and cheese then baked in a casserole. Meat sampler with Adana Kebabı, Chicken Doner, Dana şiş. Melted Belgium chocolate with Kahlua topped with homemade whipped cream and walnuts. Semolina cake soaked in a lemon honey scented syrup. Layers of phyllo dough with walnuts, baked and topped with syrup and pistachio nuts. Yaprak Dolması- Turkish grape leaves filled with our own blend of rice, pine nuts and currant stuffing. Mercimek Köftesi- Red lentil patties made with bulgur wheat, spicy Antep pepper, scallions, mint and parsley. Sebzeli Musakka- Layers of eggplant, zucchini, carrots, peas, peppers, onions, tomatoes and potatoes, topped with Bechamel sauce and cheese. Hünkar Beğendi (Sultan’s Delight)- A classic Ottoman dish served with a choice of cubed sirloin beef or hormone free chicken over a creamy smoked eggplant sauce. Beyti Kebab – A classic Turkish dish consisting of ground lamb, grilled on a skewer and served wrapped in lavash and topped with tomato sauce and yogurt. Balık Böreği - Gulf Coast Tilapia wrapped in phyllo dough and baked in a stone oven, served over sautéed baby spinach, topped with pine nuts and red wine sauce. 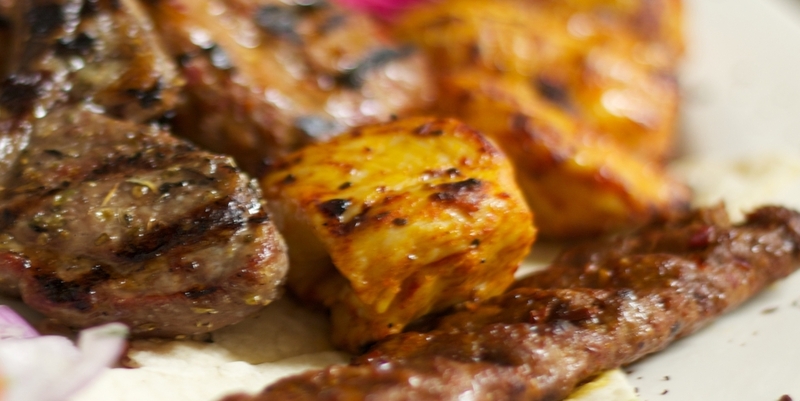 Tavuk Adana Kebabı – Spicy ground chicken char-grilled on a wide skewer. Baklava - Layers of fillo dough with walnuts, baked and topped with syrup and pistachio nuts. Kazan Dibi- Caramelized upside down milk pudding served in layers. Antep Hummus – Hummus baked in stone oven topped with pine nuts. Yaprak Dolması-Turkish grape leaves filled with our own rice, pine nut and currant stuffing. Mercimek Köftesi – Red lentil patties made with bulgur, spicy Antep pepper, scallions, mint and parsley. Ispanaklı Pide (Turkish Pizza)- Fresh baby spinach sautéed wıth onions and spices and cheese. Tavuklu Pide(Turkish Pizza)- Char grilled chicken breasts mixed with onions, green peppers and cheese. Mantı - Steamed dumplings stuffed with ground lamb and beef served in a yogurt and garlic sauce. Adana Durum(Wrap) – Spicy Adana Kebab with Acili Ezme spread. Tavuk Durum (Wrap)- Char grilled chicken breasts with Acili Ezme spread. Çoban Salatası & Yaprak Dolmasi – Chopped tomatoes, cucumbers, peppers, onions, fresh dill, mint and parsley mixed with extra virgin olive oil and lemon juice & Turkish grape leaves filled with our own blend of rice, pine nuts and currant stuffing. Mantı- Steamed dumplings stuffed with ground lamb and beef served in a yogurt and garlic sauce. İskender -Döner Kebab on a bed of toasted Turkish bread, home-made yogurt and tomato sauce. Kadayıf - Baked shredded wheat stuffed with walnuts, flavored with honey syrup and garnished with pistachios. Tavuk İskender - Chicken Döner Kebab on a bed of toasted Turkish bread, home-made yogurt and tomato sauce. İstim Kebab – A classic Ottoman dish of lamb shank, slow braised in a tomato & herb marinade, served over a creamy smoked eggplant puree. Balık Böreği – Gulf Coast Tilapia wrapped in filo dough and baked in a stone oven, served over greens, white wine & tomato reduction, garnished with toasted pine nuts. Vegetarian Musakka -Layers of eggplant, zucchini, carrots, peas, red & green pepper, onion, tomato and potatoes topped with béchamel sauce and cheese then baked in a casserole. Karışık Izgara (Mixed Grill)-Meat sampler with Adana Kebabı, Chicken Doner, Dana şiş. Crème Chocolate-Melted Belgium chocolate with Kahlua topped with homemade whipped cream and walnuts. Kazan Dibi-Caramelized upside down milk pudding. Şekerpare-Delightful baked golden cookies made with semolina and soaked in sweet scented syrup. Karniyarik –A classic Turkish dish consisting of eggplant stuffed with a mix of sautéed chopped onions, garlic, black pepper, tomatoes, parsley and ground beef. İstim Kebab -A classic Ottoman dish of lamb shank, slow braised in a tomato & herb marinade, served over a creamy smoked eggplant puree. Balık Böreği -Atlantic Salmon wrapped in filo dough and baked in a stone oven, served over greens, white wine & tomato reduction, garnished with toasted pine nuts. Vegetarian Musakka-Layers of eggplant, zucchini, carrots, peas, red & green pepper, onion, tomato and potatoes topped with béchamel sauce and cheese then baked in a casserole. Firinda Ördek- Slow roasted duck leg, bathed in a fragrant spice run and served with traditionally cooked blackcurrant, pine nut rice and grilled vegetable. Crème Chocolate – Melted Belgium chocolate with Kahlua topped with homemade whipped cream and walnuts. Kadayıf -Baked shredded wheat stuffed with walnuts, flavored with honey syrup and garnished with pistachios.